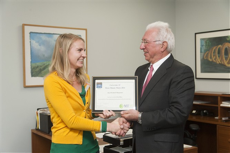 Ms. Amy Marquardt, PhD candidate in the Department of Materials Science and Engineering, receives the 2014 U21 3MT award from Dr. Charles Caramello, Dean of the Graduate School. Photo by Thai Nguyen. College Park, MD – The University of Maryland Graduate School is pleased to announce that Amy Marquardt, a PhD candidate in the A. James Clark School of Engineering, has been awarded first place in the international Three Minute Thesis (3MT®) competition. The competition, which is hosted by Universitas 21 (U21), an international network of research universities, challenges doctoral students to communicate the significance of their research to a non-specialist audience in just three minutes. The judging panel was impressed with Marquardt’s transparency and succinctness in explaining her research. The general public agreed, voting her into first place in the People’s Choice competition as well. The Graduate School initiated and organized a University-wide competition this past summer. A faculty selection committee chose Marquardt as the winner for her dynamic presentation of her research, which seeks to revolutionize the way society preserves cultural artifacts by using an nearly invisible, yet highly-protective coating that enhances the protection of the objects and reduces the damage caused by current methods. Marquardt, who is advised by Professor Ray Phaneuf in the Department of Materials Science and Engineering, found the competition challenging, yet rewarding. Marquardt competed with 16 other finalists from eight countries, who were advanced from the hundreds of students who participated in local competitions. Her U21 first-place prize includes $2500 to visit a U21 university of her choice to advance her research and ongoing career development. Her People’s Choice prize includes $300 and the opportunity to work with 99Scholars to have her presentation turned into an animated video - an innovative way to share the presentation online and via social media. Marquardt’s UMD prize included $500 in research funds from the Graduate School and a nomination to the international competition. For the past several years, Marquardt has been part of a team working with conservators from the Walters Art Museum in Baltimore, Maryland, to develop nanometers-thick coatings that protect silver artifacts from tarnish. Applied through atomic layer deposition (ALD), the coating material is currently being tested on an artifact from the museum’s collection. The project has been highlighted by Science, the American Physical Society, and the American Vacuum Society, and was the subject of a National Science Foundation video. Marquardt recently participated in an international research exchange program with the University of Trento, Italy, where she worked with Massimo Bersani at the Fondazione Bruno Kessler. While she focused on the development of a kinetics model for the corrosion and tarnishing of metal objects, she also continued her work on the optimization of ALD metal oxide films that could be used to protect them. In addition to her 3MT win, Marquardt has been awarded a 2014-2015 research-in- residence fellowship at the Smithsonian Institution’s Museum Conservation Institute (MCI), one of only six Committee on Institutional Cooperation (CIC)/ Smithsonian Fellowships awarded nationally for this year. Marquardt is collaborating on a project that could create a more effective way to preserve bronze art and artifacts. Marquardt’s other recent awards include the Graduate Excellence in Materials Science Diamond Award from the American Ceramic Society and the Dean's Doctoral Research Award from the A. James Clark School of Engineering. The CIC, Smithsonian, Clark School, and Graduate School are proud to be partners in supporting the work of this outstanding young researcher. Zubin Adrianvala, Urban Planning and Development, “The Ethnic Community: Urban Form, Peace, Conflict, and Violence in Urban India”. Adrianvala was named “runner-up” and received $250 in research funds from the Graduate School. The University of Maryland Graduate School provides strategic leadership for graduate education at UMD, working closely not only with the university’s twelve colleges and schools, but also with national and international organizations such as U21, the AAU Association of Graduate Schools, and the Big Ten’s Committee on Institutional Cooperation. The Graduate School Office for International Initiatives was created to help advance UMD’s global outreach and impact at the graduate level and to align with President Loh’s goal of establishing UMD as an international leader in innovation and academic excellence. In addition to nominating Marquardt to the 3MT competition and representing UMD at U21 meetings, the Graduate School sponsored three UMD graduate students to present their research at the U21 Graduate Research Conference on Ageing in Auckland, New Zealand, in Summer 2014.